I took that picture in 1998 for some reason I don’t remember. It’s the top of 48 White Street, the center section of a triple-wide loft building completed in 1867. It’s now part of the Tribeca East Historic District, but there are some peculiar things going on here. First, despite its use and construction date, the facades are not cast iron. They’re cast iron at the ground floor and masonry above with cast-iron trim. The walls are brick and the facade has marble veneer. 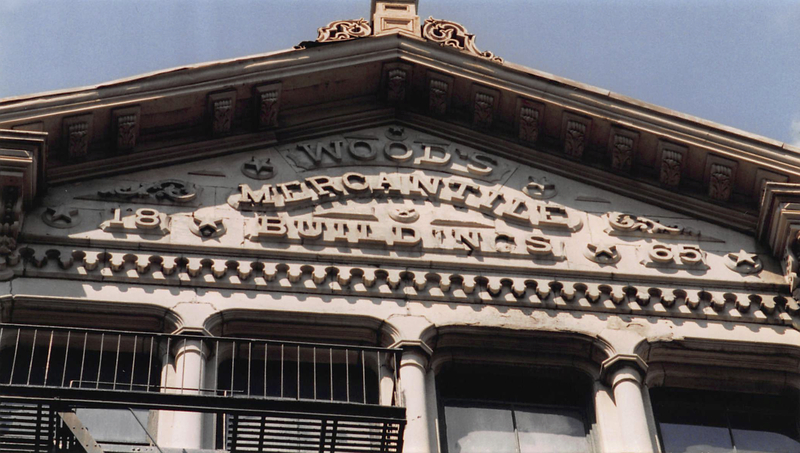 If you click on the picture to expand it, you’ll see that the letters “ING” in “BUILDINGS” are broken in the manner one would expect of marble, not cast iron. The real oddity is the architectural style. A lot of early cast-iron facades slavishly imitated the stone masonry facades of the era and would have classically-styled ornament. That was quickly simplified and eventually a new iron style – one that might be called proto-modern – appeared. It was related to the neo-grec style used in masonry, but it has some peculiarities. One of them is the use of flat arches with curved corners, a shape that makes little sense for an arch but has some advantages in iron of separating the spandrel-panel-to-column connections from the panel-to-panel connections. In any case, what you see above is marble veneer in that version of the neo-grec style. In other words: masonry imitating iron, in a style developed for iron after iron was developed in imitation of masonry. The past is always more complicated than we think it is.